The MP4-29's rear end is perhaps the most scrutinized of any car thus far and that's primarily to do with the 'Wishbone Wings' the team have cleverly concocted. However there are still more things going on at the rear of the car worth noting especially as their presence enhances the 'Wishbone Wings'. 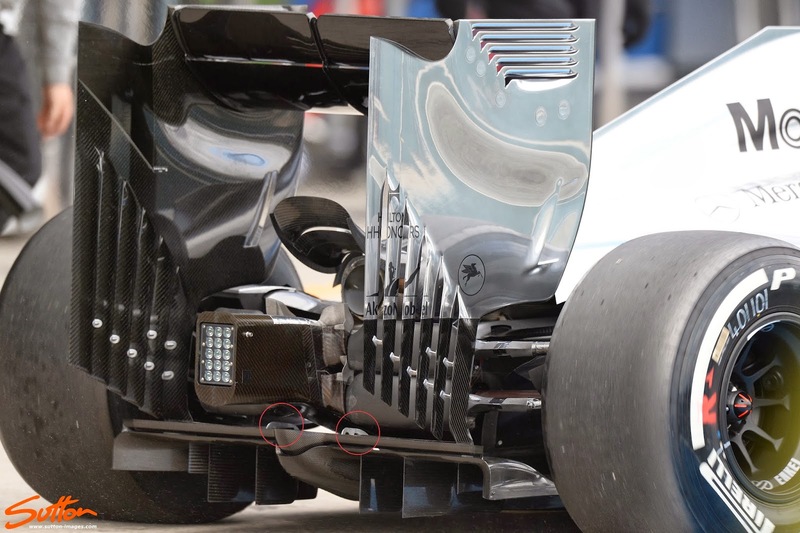 In this case we need to look at an element that has also cropped up on the Williams and Toro Rosso whilst I'd strongly suspect Ferrari and Mercedes will also be utilising one too as their floor/diffuser is shaped according to it's usage. I'm talking about the lower wing element that not only adds structural integrity to the whole Rear Wing assembly in absence of the Beam Wing, but also aids in creating a flow structure conducive to adding downforce. Sitting at 150mm above the reference plane in order to stay inline with the regulations the wing offers another surface with which to enhance the upwash generated by the Diffuser. In the case of McLaren this is particularly useful as it aids in facilitating the low pressure zone behind the Wishbone Wings with airflow, perhaps even reducing some of the drag induced by the elements. The floor around the Y100 region has been further carved out (like the other teams mentioned above) to further enhance the passage of airflow in the central region of the Diffuser, creating a further link in the airflow structures desired by the teams this season. 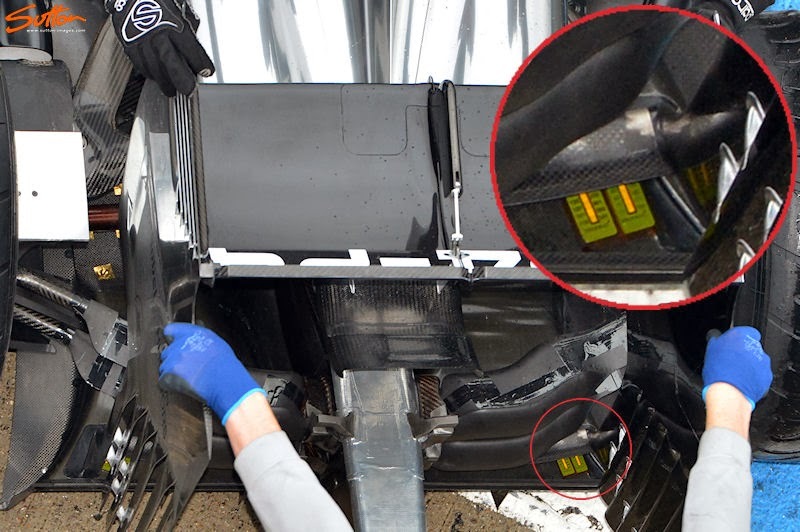 Framing the Y100 region beside the crash structure we find two swan neck supports (circled), these metal supports reach down to the MP4-29's floor further increasing the rigidity of the Rear Wing, whilst providing a divisional guide for the airflow.